For these pendants I used dried poppy seed capsules. It’s just plain poppy from my own garden. You can still hear the seeds inside if you shake them. 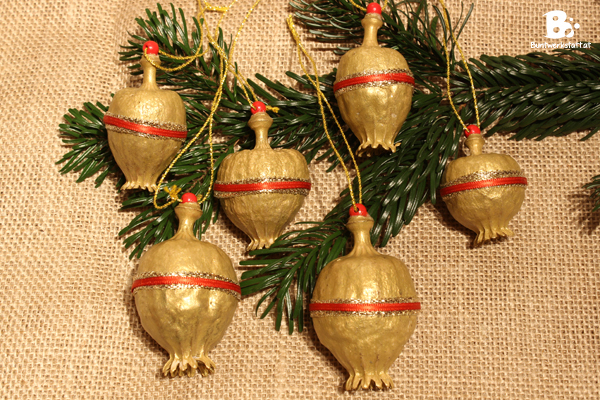 I used golden metallic paint (available here*) on the capsules and glued a ribbon around it. I also added a little bead on the top for a golden thread. Aren’t they pretty? Those pretty stars are fairly easy to make. You don’t need to make knots or anything complicated. It is just some white thread soaked in wood glue. To make those stars, I put some nails into a wooden board and cut off the nailheads. I put the nails into circles of different sizes. But the circles all had the same center. 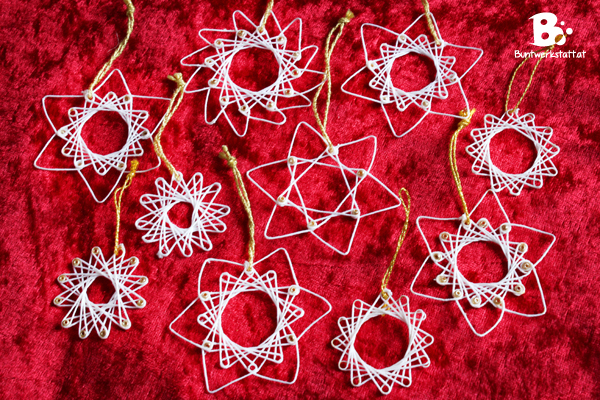 Those ornaments are also made of white thread and wood glue. I inflated little water ballons and put on a thin layer of petroleum jelly. Then I wrapped around the white thread (which needs to be soaked in wood glue beforehand) erratically. 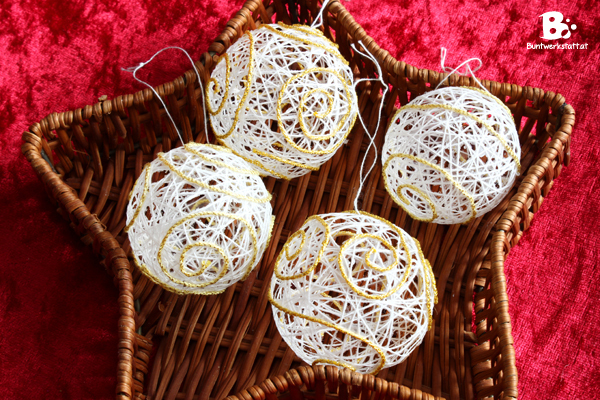 Once the glue has dried, you can pop the balloon and remove it carefully from the ornament. If you want, you can decorated it with some golden thread as well. The petroleum jelly prevents the thread from sticking to the balloon. If you want to know more about those pretty orange clove pomanders, you can read about them here! 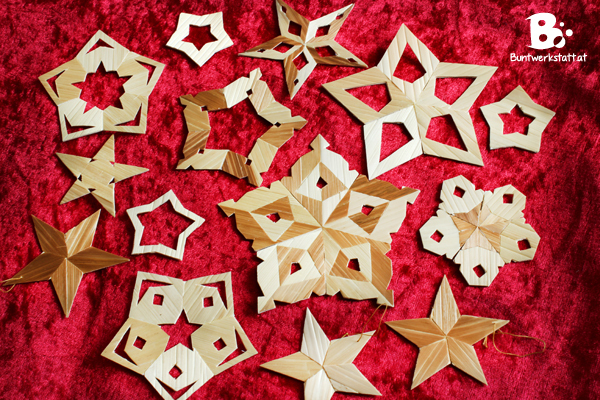 To make one star, cut out two identical star shapes from a piece of cardboard. Place crumpled-up newspaper between the two stars and wrap some strips of paper (soaked in flour paste) around them. 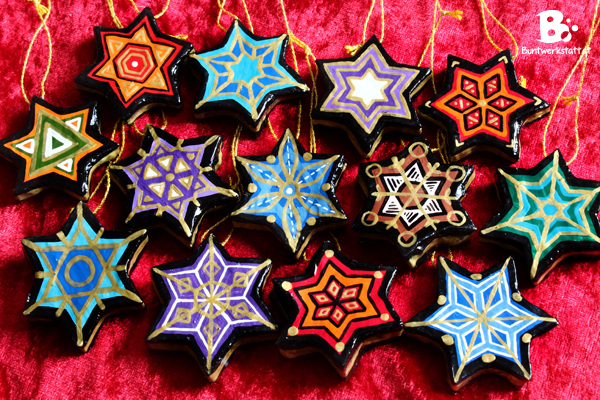 This way you should get nice papier-mâché stars. Once they have dried you can paint on them. I used acrylic paint (available here*) and metallic paint (available here*). For those straw stars you need to soak some straw in warm water, cut the straws open on one side and iron them flat. If you put the iron on the straw a little longer, it gets darker. You can make quite interesting patterns this way. I cut out the stars (or elements of it) from thin cardboard and glued the flat straw to it. White wood glue works best, since it dries invisible. Glue the different pieces together and you have your star. 🙂 For intricate details, you can use a sharp cutter knife to cut out holes or jags.